Welcome to a new week, friends! Did you have a nice weekend? Get any snow? We ended up with around 7 inches of snow and are dealing with some cold temps right now! It’s 1º out there right now. Brrr. The snow began Saturday morning and pretty much continued for most of the day, so we spent the day in our pjs… which never happens for me! It’s hard for me to sit around doing nothing, let alone stay in my pajamas all day. Once 2pm hit I got really restless and bored, so I whipped up some homemade pasta. That made for one tasty dinner! Sunday morning we headed out to shovel, which wouldn’t have been too bad if it weren’t so cold and windy out. I was definitely happy to get back inside after that! We watched “The Secret Life of Pets” in the afternoon… hilarious! Yes, it’s a kid’s movie, but if you have pets (and enjoy animated movies), you’ll totally find it funny. Ok, enough about my weekend. Let’s get to the real reason you’re here… FOOD. 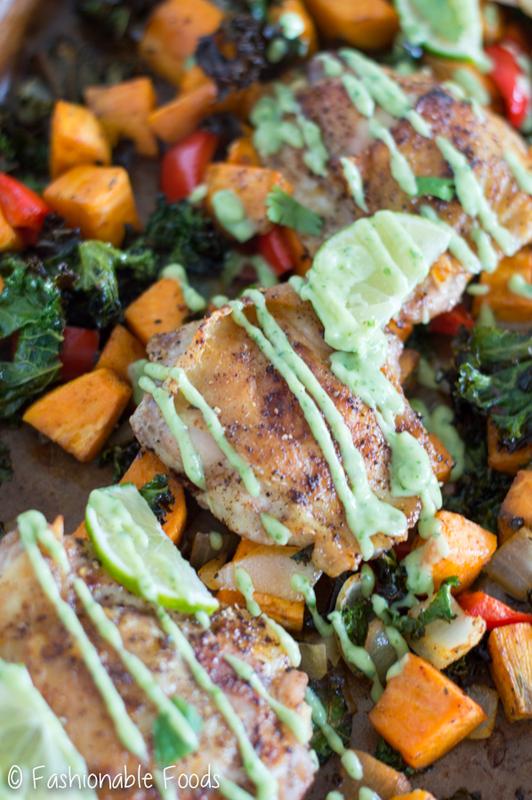 If you’ve made a resolution to eat healthier, you need some sheet pan meals in your life! Not only are they incredibly easy, but a great way to get your protein and veggies in. 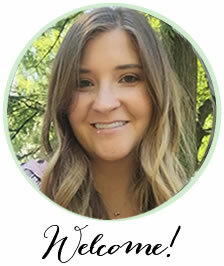 And, for all of my Whole30 peeps, you are going to love this one! 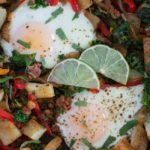 I know there are a lot of you doing a Whole30 this month because this recipe is getting lots of love. If you’ve been following me for a while, you know Whole30 didn’t work out for me, but I’m still a huge supporter of it. 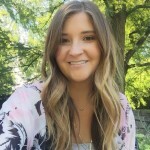 I’ve seen so many success stories and want to keep turning out compliant recipes so that you all have tons of delicious options! In my case, it just wasn’t necessary for me since I already have good eating habits. Plus, I have an obsessive personality… so I was getting a little crazy! 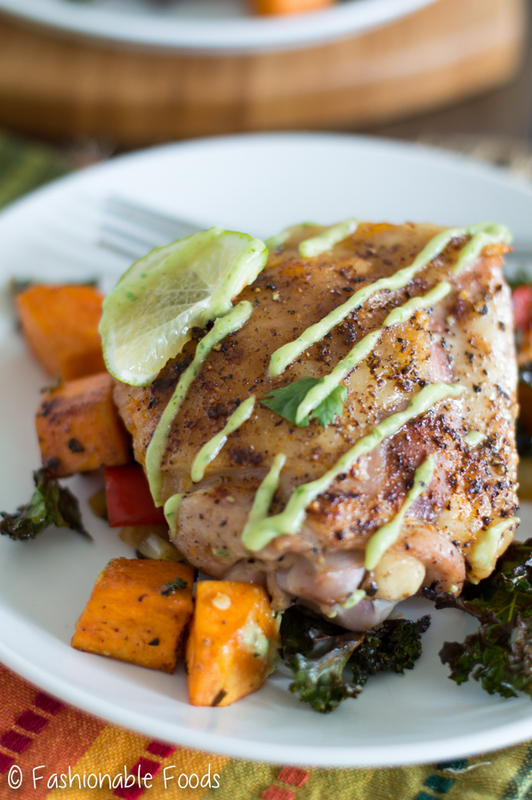 Enough about me, let’s talk about southwest chicken thighs and vegetables! Sheet pan dinners are all the rage these days… for good reason! You basically throw some veggies and protein on a sheet pan, season it up, and pop it in the oven. It doesn’t get much easier than that. Because I can’t leave anything alone, I just had to make an avocado aioli to finish things off! 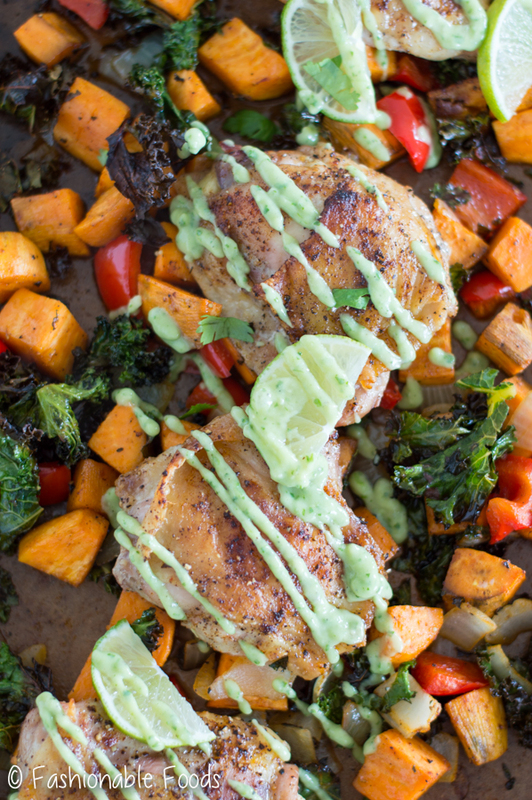 The chicken thighs and veggies are good as is, but that aioli just takes ’em to the next level. Plus, it adds a fresh component, which is always welcome in the winter months. The best part about this recipe is the versatility. 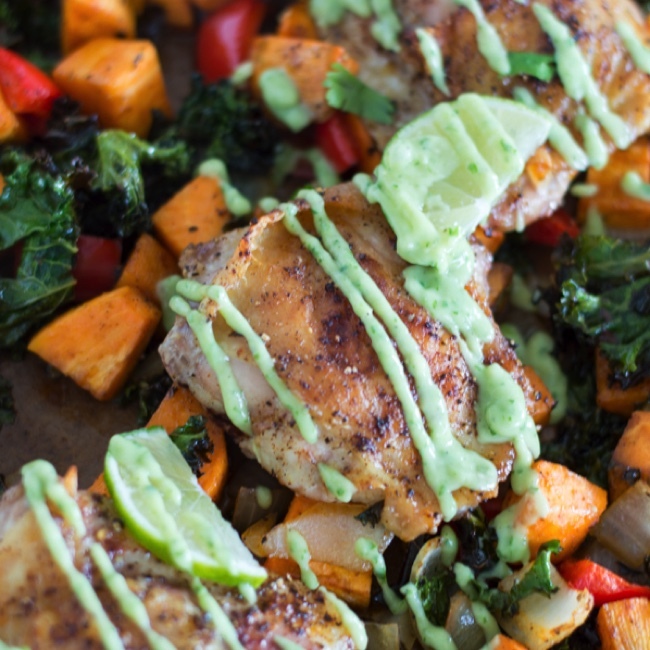 If you don’t like chicken thighs (whaaaat?! ), you can use breasts… or try pork chops, salmon, or shrimp. You can also use whatever veggies you like! 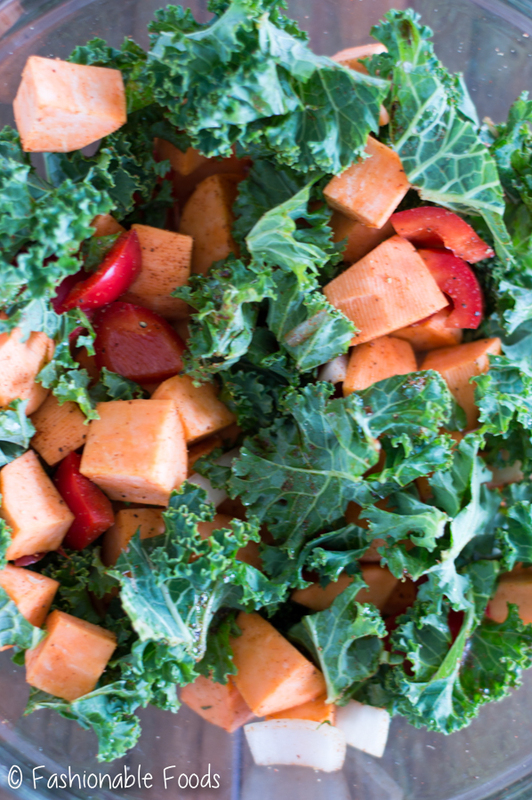 I’m all about using seasonal vegetables, so I used sweet potatoes and kale with some peppers and onions tossed in. In the summer I’d probably use zucchini and fresh sweet corn (not Whole30, though!). Use a meat thermometer! Obviously cooking chicken to a proper temperature is always important, but because everything is on one pan, the veggies are absorbing the fat/juices from the chicken thighs. So, you really want to be sure the chicken thighs are cooked through. If using a different protein, you’ll need to adjust the cooking time accordingly. 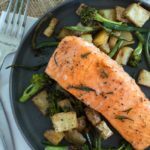 For example, if you want to make this with salmon, you’d need to give the veggies a head start since the salmon will only take 15-20 minutes to cook. The avocado aioli is completely optional, but obviously I highly recommend it! Fresh lime juice and the kick of garlic in the aioli really finish off the dish perfectly. Plus, that pretty green color is hard to resist! 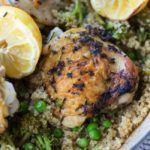 I hope you all have a fantastic start to your week… and if you haven’t already, you need to introduce some sheet pan dinners to your life! ? 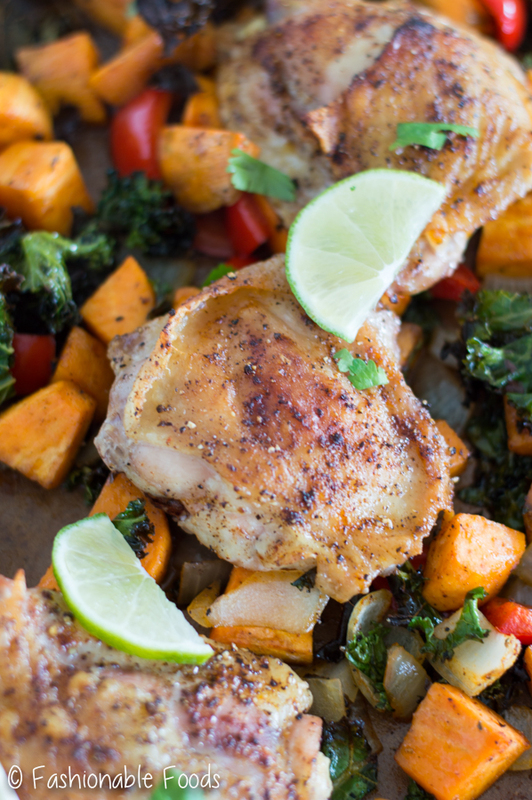 Sheet pan dinners are the perfect way to eat healthy when pressed for time. 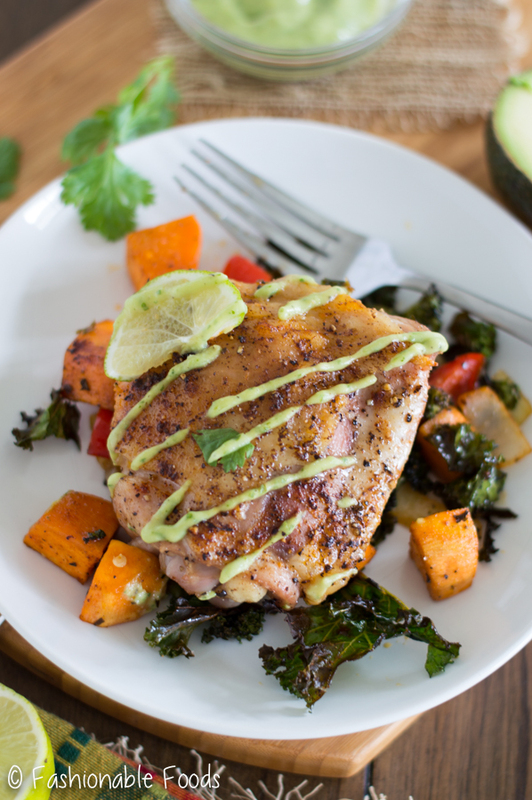 Southwest chicken thighs and vegetables is a dish that’s full of flavor, satisfying, and incredibly easy! In a small bowl, combine the salt, paprika, garlic powder, black pepper, and chipotle powder. 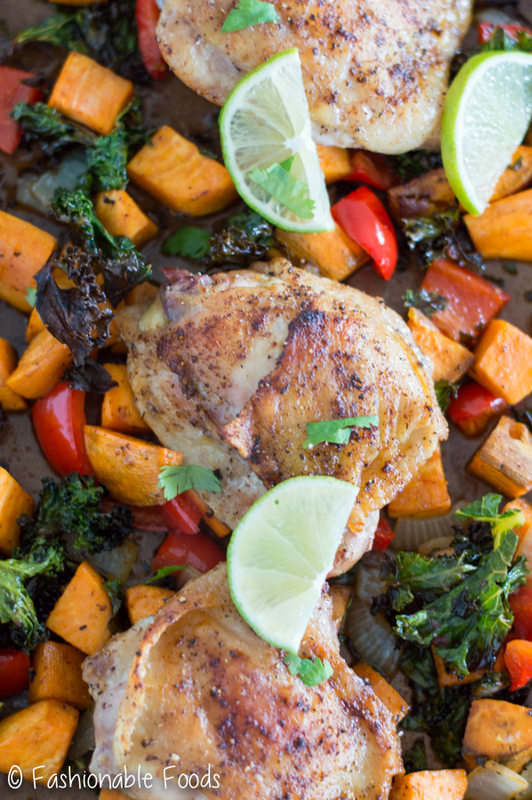 Place the sweet potatoes, bell pepper, onion, and kale onto a sheet pan. Drizzle the vegetables with half of the olive oil and sprinkle them with ½ of the spice mixture. Toss well to combine. Drizzle the chicken thighs with the remaining oil and sprinkle with the rest of the seasoning. Rub the chicken thighs until the oil and spices are evenly distributed. Lay the chicken thighs overtop of the vegetables. Place the sheet pan in the oven and roast the chicken and veggies for around 30 minutes, or until the vegetables are tender and the chicken thighs register 165º on an instant read thermometer. While the chicken and veggies are cooking, make the aioli. Combine the avocado, garlic, cilantro, scallions, lime juice, salt, and pepper in the bowl of a mini food processor. Process until smooth, adding water to thin as necessary. You want the consistency to be slightly thinner than what mayonnaise would be. Once the chicken is done, divide the veggies among 4 serving plates and top each with a chicken thigh. Drizzle with aioli and serve. We got snowed in over the weekend too, Keri! BUT, we didn’t get THAT much snow. However, when it does snow here, no one knows what to do, so the whole town shuts down. Doesn’t bother me, because I’m a PJ’s for LIFE kind of girl. lol. Obviously we don’t have that in common. 😉 We do have in common our love for sheet pan meals though!! And this one looks amazing!!!! LOVE me some SW flavors and I’m sooo digging that avocado aioli! Such a delicious, easy meal! Pinned!! Cheers, girlfriend! I always want to have PJ days, buuuut me not being able to sit still always gets in my way! Parts of Delaware definitely seem to shut down when it comes to snow, which I’m totally not used to because where I’m from that doesn’t happen. But, it totally makes sense because when you aren’t used to snow, it’s best to stay safe! Thanks for the sheet pan love, Cheyanne! I love how easy you made it look to cook a full dinner! Gotta try this! Sounds like my freezing cold weather moved to your area! It was in the single digits the past few days, but now it’s in the 30s and tomorrow it will be in the 40’s…crazy winter weather! I’m ALL about sheet pan meals, though, and this looks SO good! Chicken thighs are actually my favorite, I love the meat and the skin (as bad as that is). And that aioli is calling my name! Such a pretty meal, Keri! I need to add this to my menu and soon! Yes it did! But, it’s supposed to warm up by the end of the week… to the 60s! How crazy is that?! Thanks for the kind words, Gayle! We ended up with snow, then ice, then snow and now more ice. Blah! This sheet pan chicken thigh dish looks like something that would make these cold temps better. I’m totally digging that avocado aioli! Blah… I hate ice! Snow I can totally handle, but ice is just once big annoyance. Thanks Rachelle! HOLY CRAP! THIS RECIPE IS SCREAMING: GIGI EAT ME! Hahaha… yes it definitely is! Thanks, Gigi! I think I can pull this recipe off you make it look so simple Keri, I can’t wait to try your avocado aioli.